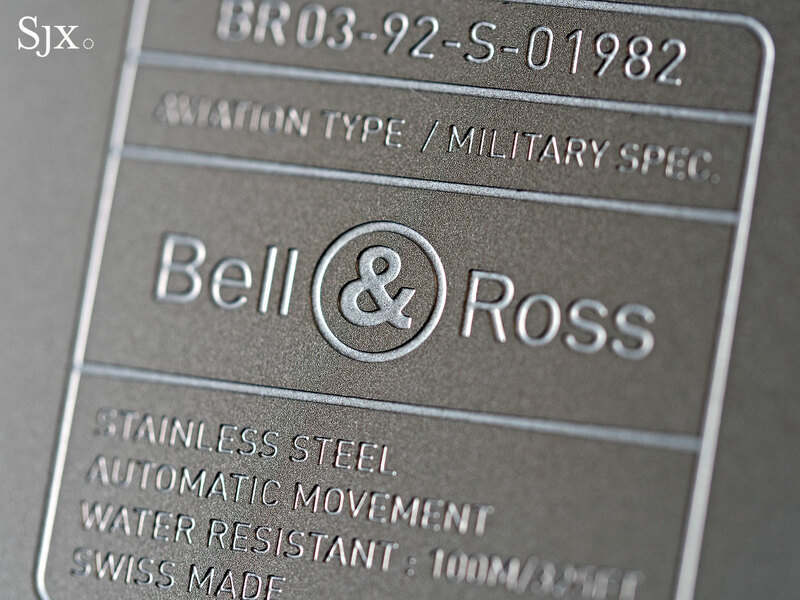 Introduced in 2005 – first as the larger BR 01 then the smaller BR 03 – the signature Bell & Ross wristwatch is modelled on analogue clocks installed on the instrument panels of vintage aircraft. 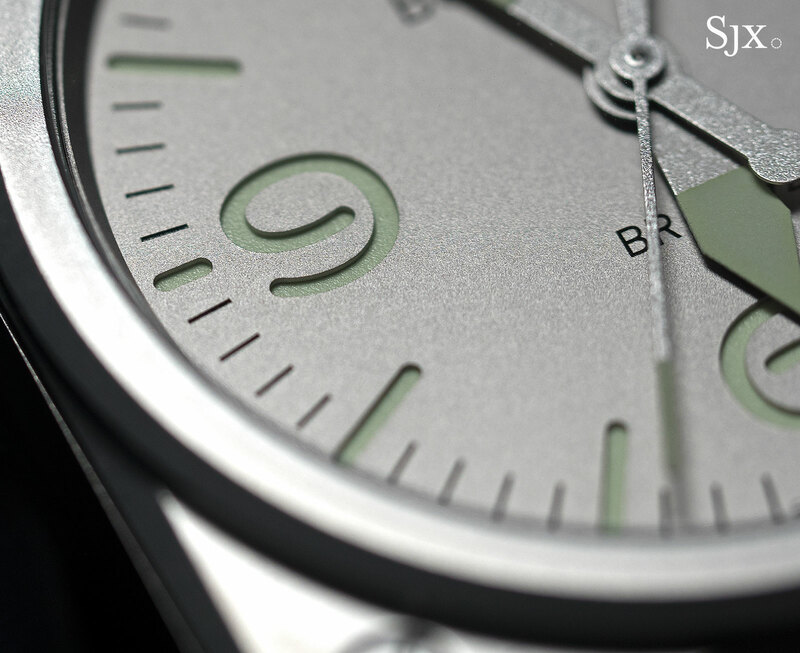 Big and square, the original BR 01 and 03s tended to be uncompromisingly military in style. A decade later the design has evolved to become to become, well, less military and more wearable. The latest in the series are the BR 03-92 Horolum and BR 03-92 Horograph, both taking different approaches towards a clean, legible look. The Horolum sticks more closely to the aircraft instrument aesthetic of its predecessors, having the same dial design, but is dressed up in an sleek, frosted finish that leaves it feeling streamlined despite the square case. 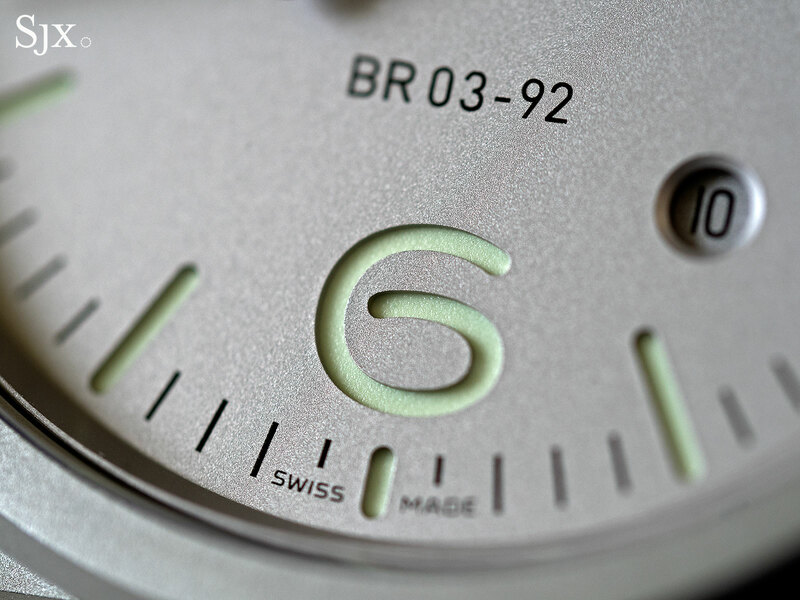 The BR 03-92 Horograph, on the other hand, is inspired by the no-nonsense clocks in airports and railway stations. 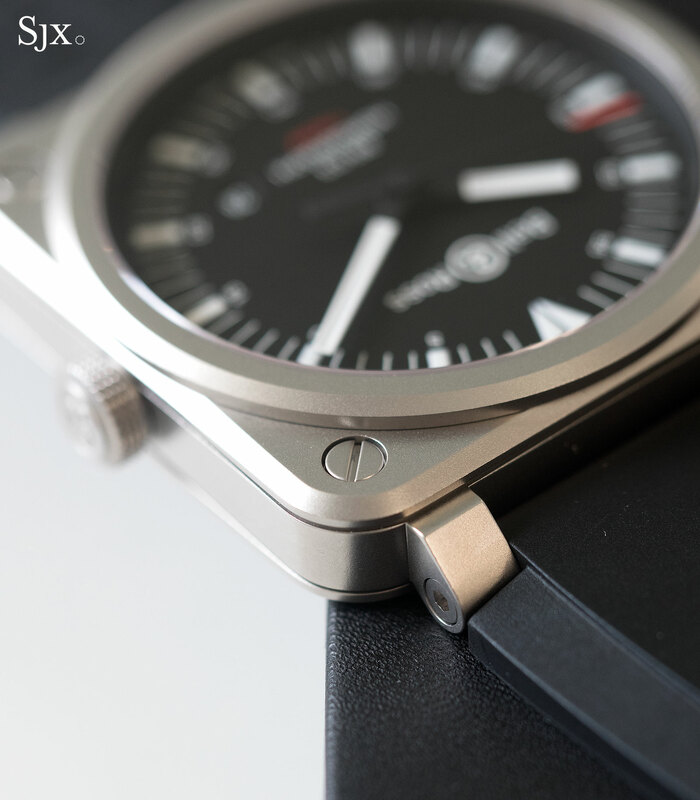 Both watches share the same BR 03 watch case that’s steel and four-sided, measuring 42mm by 42mm (the larger BR 01 case is a huge 46mm by 46mm) and rated to 100m. 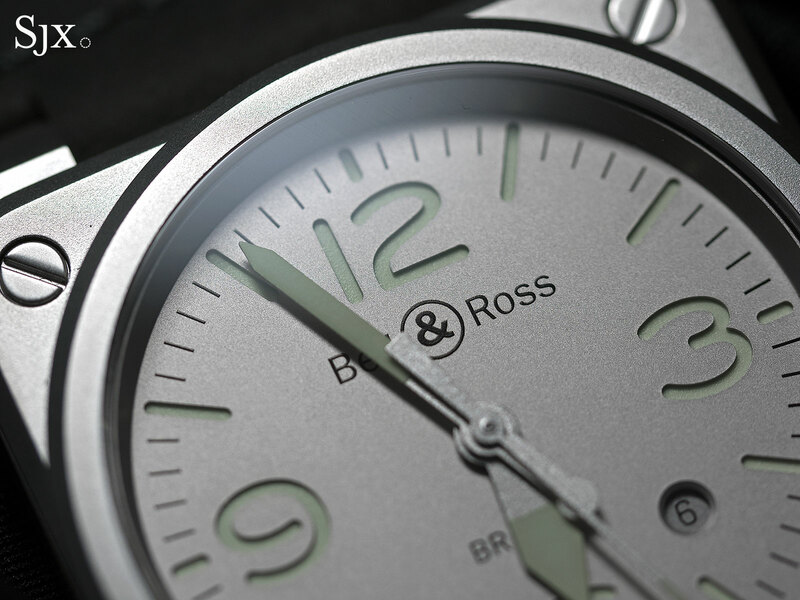 Big but wearable given the short lugs, the square case the strongest feature of the BR 03. It has neat lines and edges – the lugs and case middle are one piece and precisely joined – along with an consistent finish on all surfaces. Minuscule glass beads are sprayed onto the surface of the case at high velocity, giving it a frosted finish with a fine grain. Smooth to the touch and non-reflective, the finish is appealingly functional and grey, though vulnerable to scratches and marks that appear shiny if the surface is struck sharply. The quartet of screws on the bezel is modelled after the mountings for instrument panel clocks, but like the hexagonal screws on a Royal Oak bezel, they aren’t actually screws. 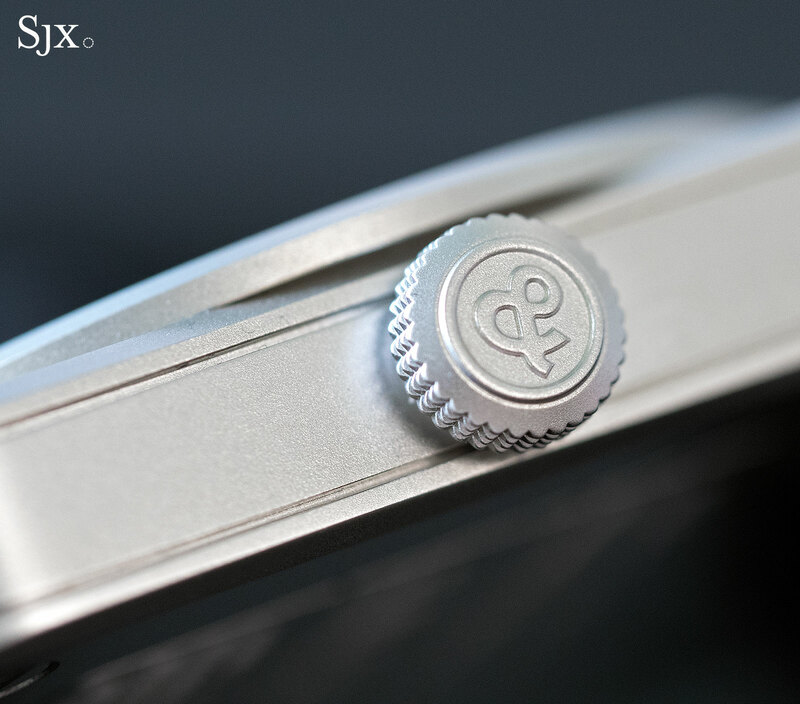 Instead the four are tubular nuts with square profiles and a screw head on top that’s purely aesthetic. These nuts slot into the bezel and extend through the case, being secured on the case back by actual threaded screws, keeping the three-piece case together. 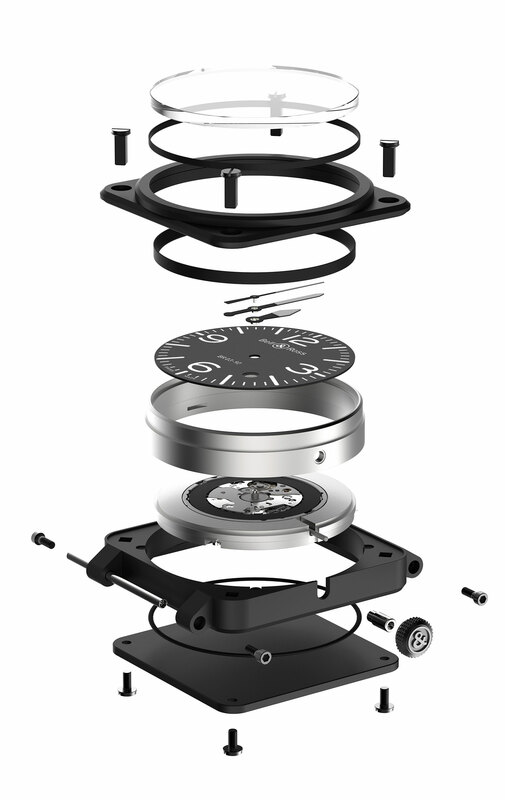 The unusual construction explains why the screw heads on the bezel are always perfectly aligned, with the slots pointing inwards and parallel to the hour markers. 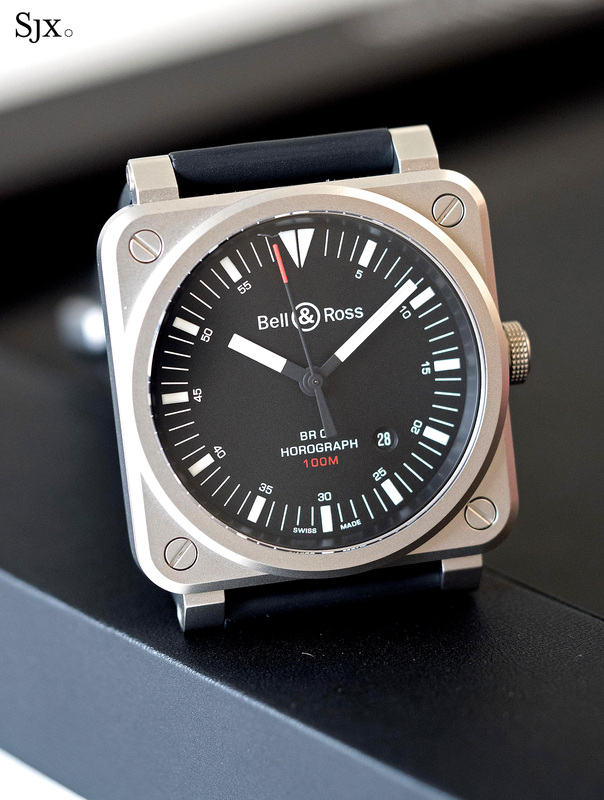 Notably, this construction is unique to the BR 03; the larger BR 01 has a more conventional case with functional bezel screws and four screws to hold down the back. 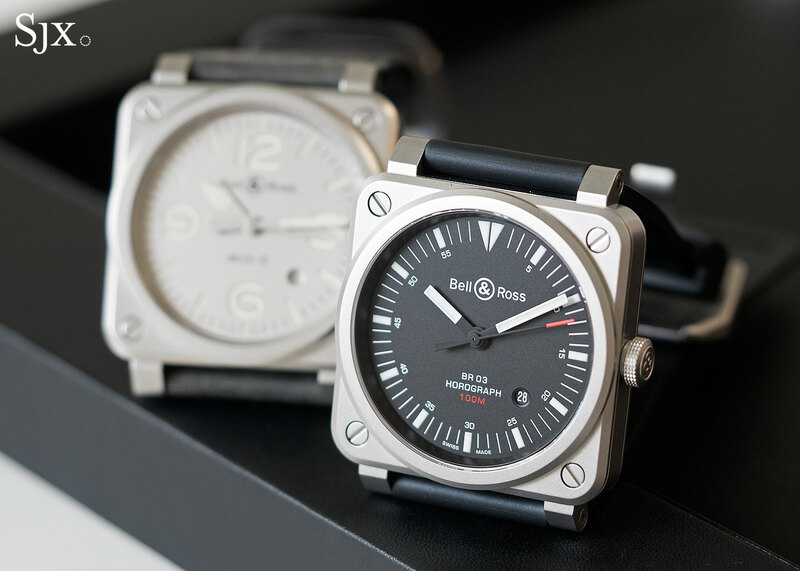 The size and quality of the BR 03 case sets its significantly apart from the usual stamped, round cases found on watches in this price range. And the secret to that is G&F Châtelain, a specialised components maker that produces cases for MB&F, buckles for Richard Mille, and of course all of the Bell & Ross watch cases. G&F Châtelain is owned by Chanel, the Parisian fashion house that has a surprisingly sizeable presence in the watch industry, also owning all of Bell & Ross, as well as a significant stake in high-end independent watchmaker Romain Gauthier. 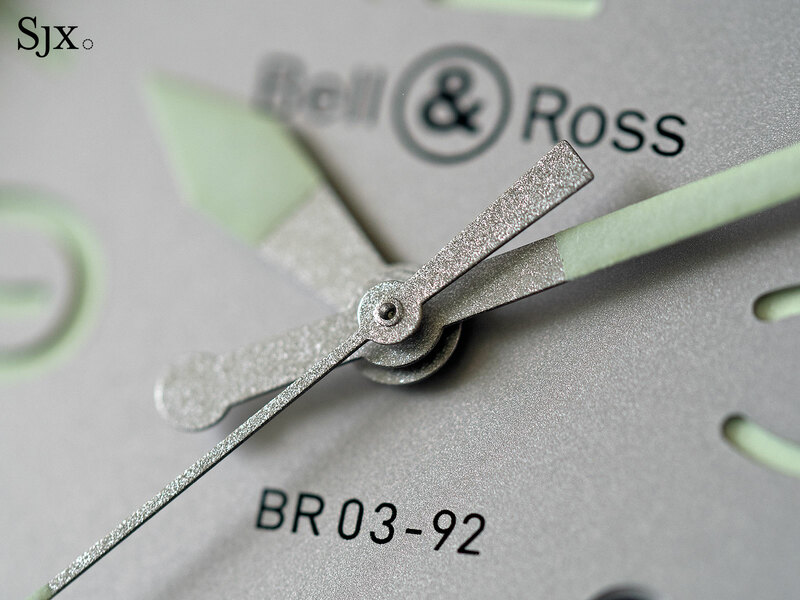 While the case is outstanding, the movement inside is more prosaic: the BR-CAL.302, which is actually a Sellita SW300. 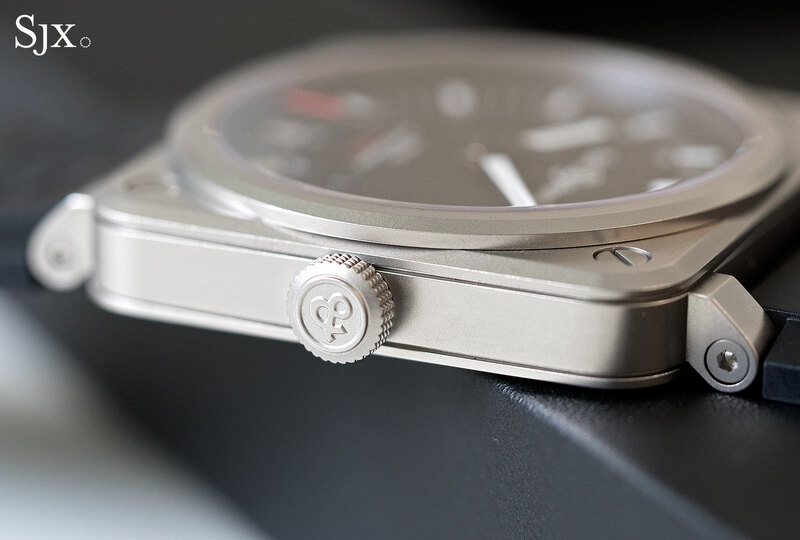 It’s an automatic with a 42-hour power reserve that’s a clone of the ETA 2892, and more importantly, cost effective, relatively thin (at 3.6mm high), and conveniently trouble-free. Of the pair the BR 03-92 Horograph is the more affordable, and also more conventional with its white on black dial. The baton indices and hands are a familiar style, but here elaborated on with five-minute numerals and a discreet date window. 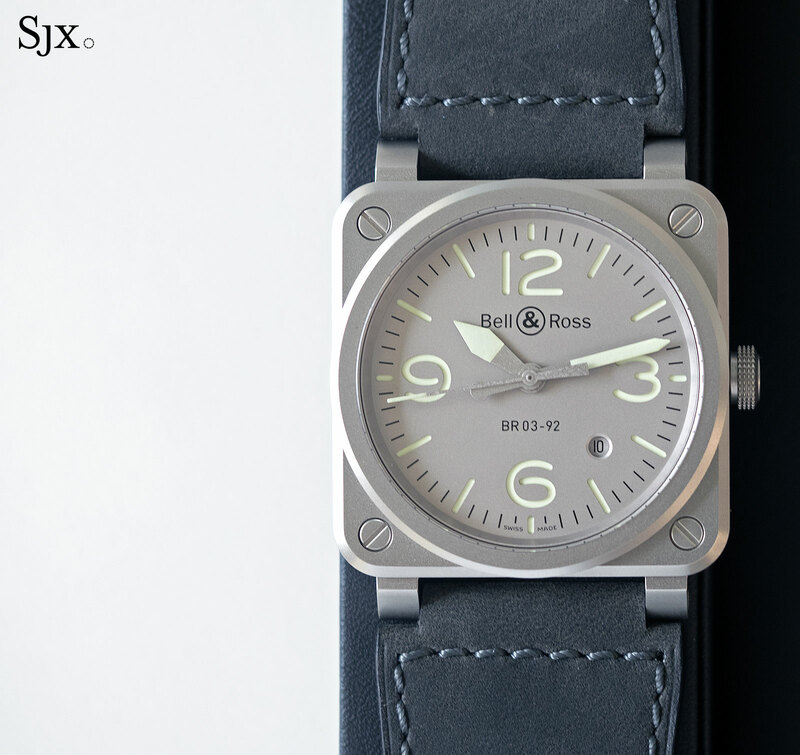 Vaguely military in style, the look is a throwback to the original BR 01 watches. 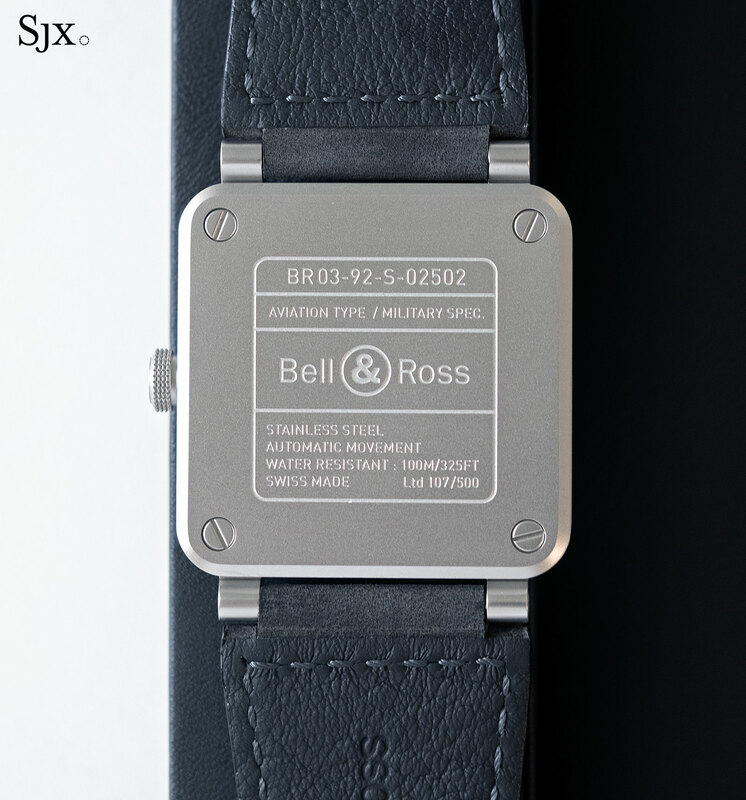 Fitted to a black rubber strap and pin buckle, the Bell & Ross BR 03-92 Horograph is part of the regular collection. 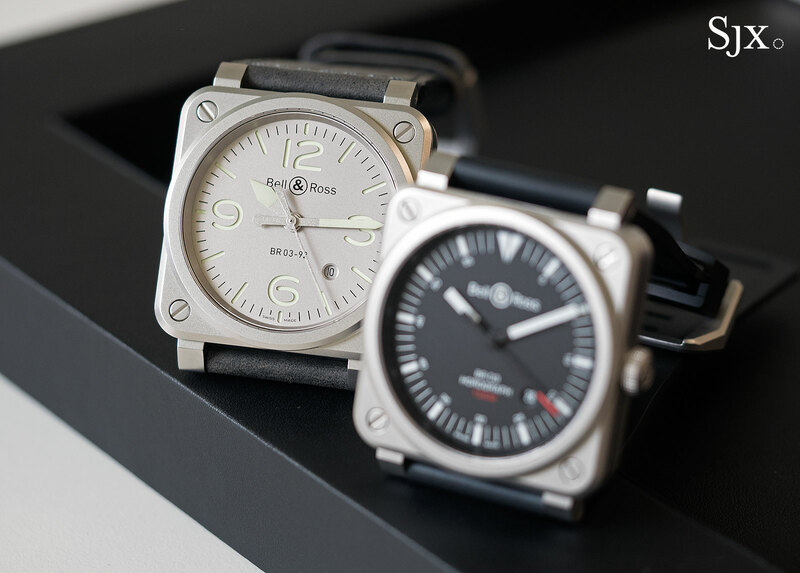 The BR 03-92 Horolum is a 500-piece limited edition, and the more compelling of the two. 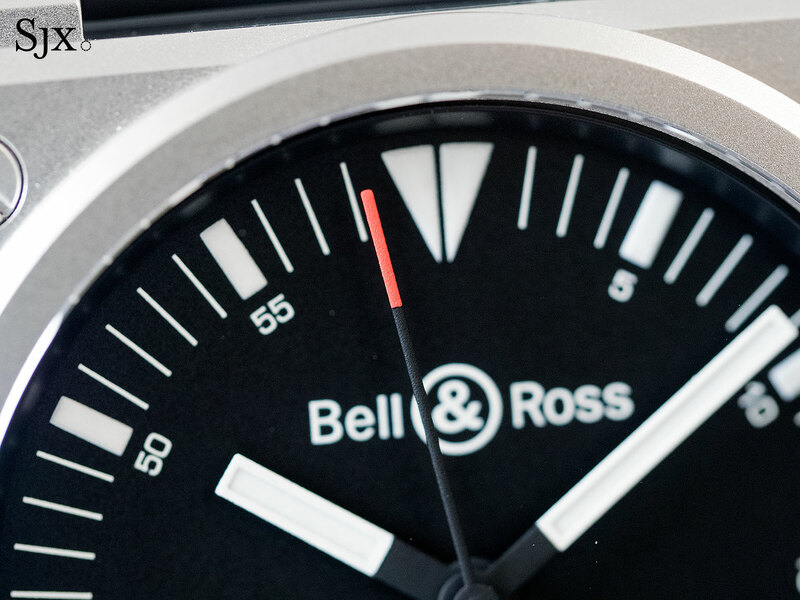 It’s monochromatic with a frosted finish on the dial, case, and even the hands – though the grain of the finish varies on each component – while retaining the trademark dial of the BR 03. Finished with a slightly finer grain than the case, the dial is rhodium-plated brass and constructed like a sandwich, comprised of two superimposed dial plates. Used for the first time by Bell & Ross, the sandwich dial was invented by Panerai in the 1940s to boost the luminosity of watch dials underwater. The name stems from the two layers of the dial: an upper plate with neat cut-outs for the hour markers, and beneath it a plate covered in Super-Luminova. 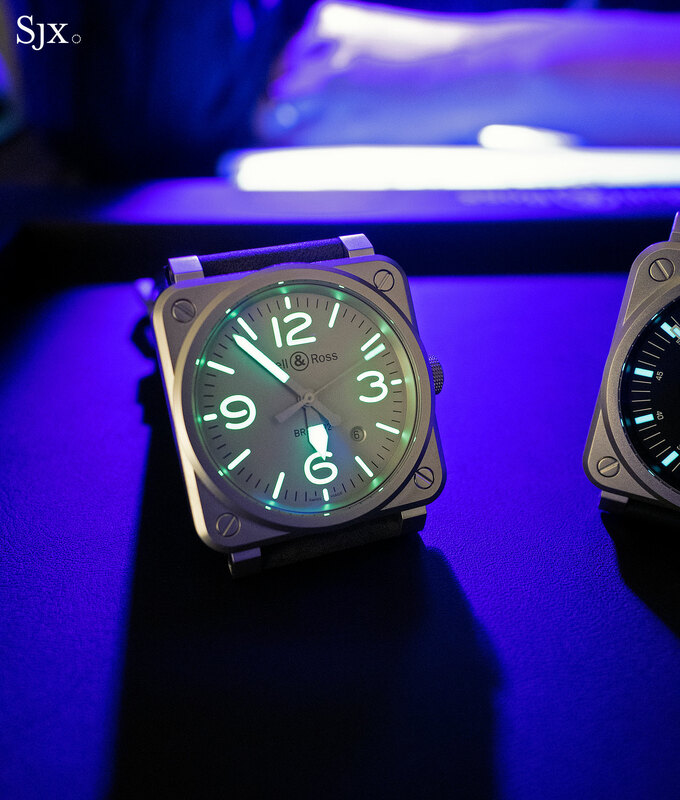 Specifically, the Super-Luminova is type C3 that’s greenish-yellow in the light and a bright green in the dark. Super-Luminova is mostly composed of strontium aluminate, which absorbs light and then glows for several hours in the dark. The hands are also coated in Super-Luminova and in the same grey as the dial. But they have coarser sandblasted finish that helps sets them stand out from the dial surface. 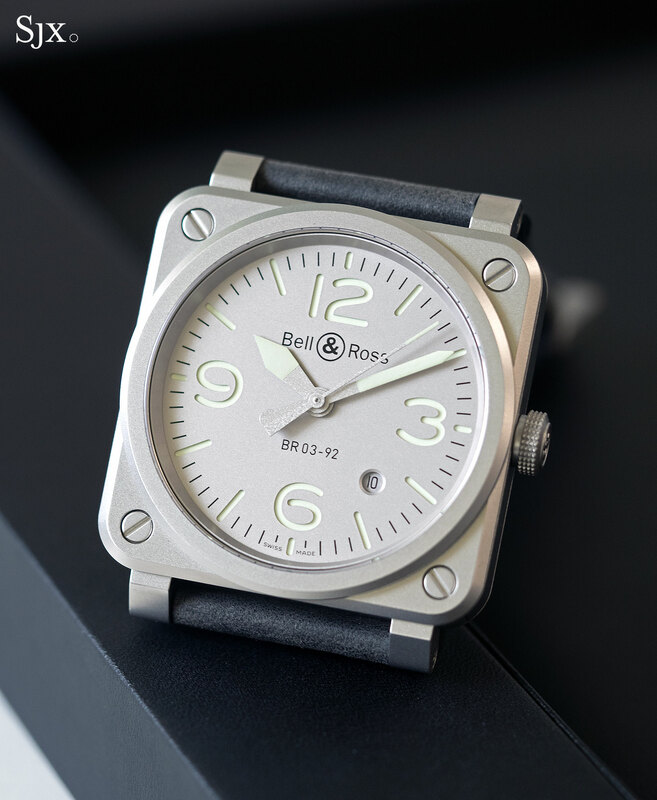 The BR 03-92 Horolum is a limited edition of 500 pieces, and fitted to a grey nubuck calfskin strap. 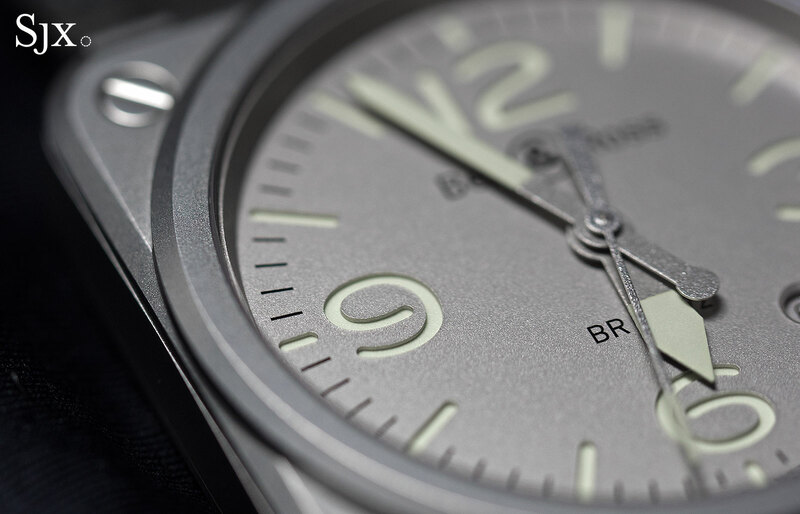 The BR 03-92 Horograph (ref. 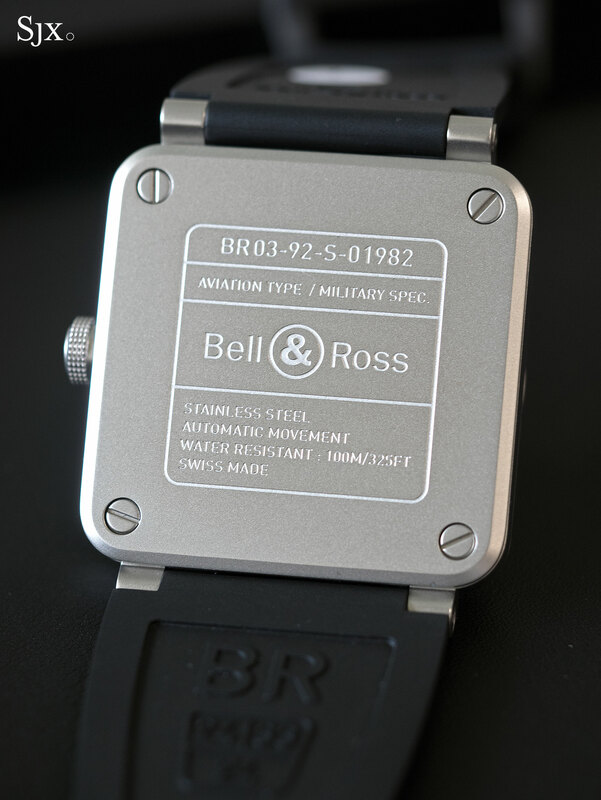 BR0392-HOR-BLC/SRB) costs US$2990 or S$4500 – for more, visit Bell & Ross. 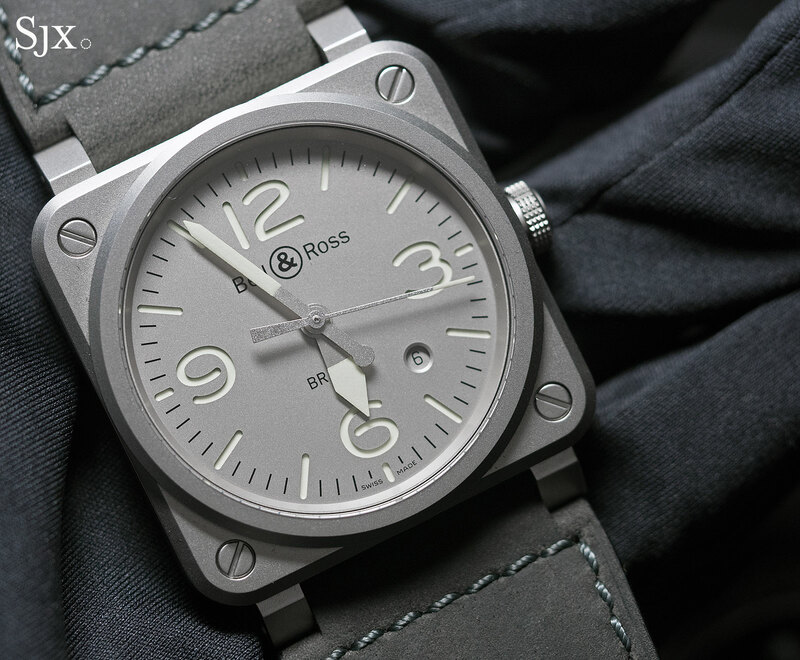 The BR 03-92 Horolum (ref.BR0392-GR-ST/SCA) is priced at US$3400 or S$4800. Additional info can be found here.